Simply press in each number called and then press the ENTER button. The handset will automatically daub all your cards. 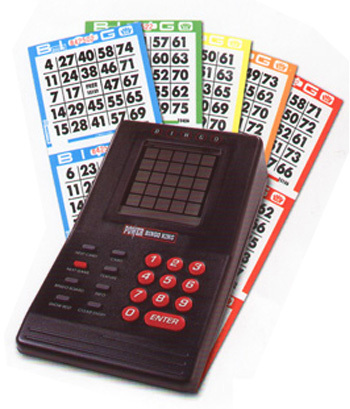 Shows game number, ball count, and how many numbers away from a bingo on how many cards. This key allows you to look at one card at a time, or hold down to scroll through all the cards. Press at any time. This key advanced to the next game or the next part of a game. Do not advance the handset until instructed by the caller. This key displays the numbers entered in numerical order. Press at any time. This key displays your best cards and shows your “on” numbers. This key displays information about the card being played, such as the card level, card number and sequence number. Press at any time. The screen saver blanks out the screen after 15 minutes. Press any key to reactivate the screen.